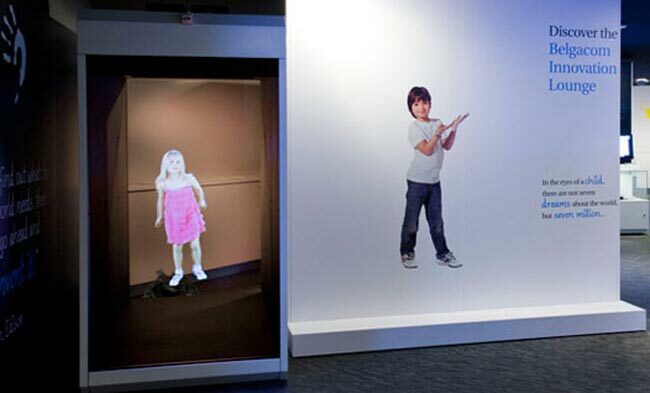 Holocubes are a fully integrated 3D projection platform and use a number of different technologies to create their holographic images. The new HC70 Holocube is now capable of creating full-sized human projections within its six foot tall box with a 70″ diagonal screen. The Holocube uses projectors, a projection booth and an ultra-simplified computer to hold the projected video attached to a 40GB solid state harddrive that can store approximately 18 hours of uncompressed video at a bit rate of 4 Mb/s or 8 hours of compressed video at 9 Mb/s. Any new presentation can be loaded on the Holocube using a USB stick and if for any reason the power is interrupted to the system, the Holocube will auto reboot to begin displaying the presentation again. More information about Holocubes can be found on the manufactures website.